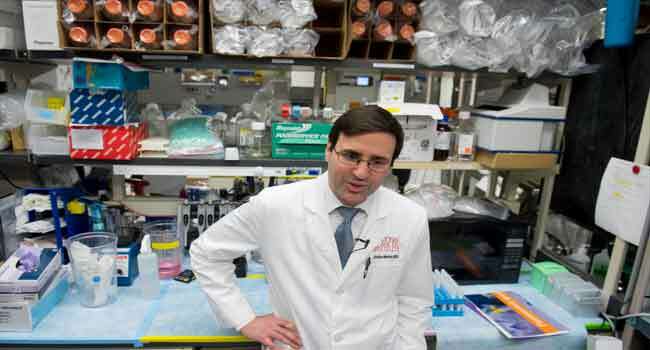 Dr. Christian Hinrichs, an investigator at the National Cancer Institute, speaks about his research in immunotherapy for HPV+ cancers, in his lab at the National Institutes of Health (NIH) in Bethesda, Maryland. Christian Hinrichs knew his life had forever changed the day he thought he was pouring milk into a glass, but heard it splashing on the floor instead. It was 2005, and the young cancer surgeon had just undergone the removal of his right eye because of rare cancer, called ocular melanoma, which affects six in a million people. Prior to the operation, his doctors had been optimistic that he’d make a full recovery and be able to return to practicing surgery. “But the reality for me personally was after I lost the eye, it really threw off my depth perception,” said Hinrichs. At the time, Hinrichs was 33 and had spent 13 years in training and in the operating theatre. Even before his own diagnosis, he’d decided to focus on cancer surgery. He also had an interest in cancer research, particularly the burgeoning field of adoptive T-cell therapy, which involved genetically engineering the immune cells to recognize and attack cancer. But after his eye was removed, he felt like a “square peg” that didn’t fit anywhere. “I was a surgeon who couldn’t operate, and I was interested in oncology but I wasn’t an internal medicine doctor,” he said. So he went back to school to train as an internal medicine doctor and oncologist, a process that took four years. Going back to being a medical resident — while married with a one-year-old son at home — was “a huge drop down the ladder,” he recalled. But he was more driven than ever to find another way to beat cancer when surgery, chemotherapy and radiation failed. For Hinrichs, the fight was now personal. “If cancer ever came back in me at a site distant from the eye, I would be in that group of incurable patients,” he said, explaining that his cancer would then be considered metastatic, and fatal. The odds of a recurrence, for his type of cancer, were about 50 percent. Hinrichs, now 46, is an investigator at the National Cancer Institute and leads experimental trials aimed at training the body’s T-cells to eradicate cancers caused by the human papillomavirus (HPV). Two women who participated in one of his early clinical trials against cervical cancer have been disease-free for five years, and are now considered cured. Many of the trials he runs at the National Institutes of Health Clinical Center, the nation’s top research hospital, are considered “first-in-human,” aimed at testing an experimental treatment in people for the first time. They typically enrol one or two dozen patients with advanced cancers that have stopped responding to every other treatment. Most patients aren’t cured. But some see their cancers disappear in months. And that can lead to new treatments which may one day reach the broader public. Colleagues describe Hinrichs as blunt, honest and direct, traits that may have been sharpened by his cancer ordeal. “He told me on day one,” about his experience with cancer, said NCI researcher Lindsey Draper, who works in Hinrichs’ lab and is testing a next-generation T-cell therapy that arose from an earlier HPV trial. Hinrichs sometimes tells patients about his backstory if they ask how he got into this field, or if he thinks it will help them somehow. For his part, Hinrichs decided to stop getting follow-up MRI and CT scan about five years after his eye was removed. A long-time Presbyterian, he says his faith carries him through times of uncertainty. When it comes to his particular cancer, “the statistics are really of limited value, anyway,” he added. So he presses on, designing trials that are intended to cure advanced cancer with a single infusion of billions of super-charged T-cells that will take aim at tumours wherever they lie in the body. Hinrichs thinks pursuing any other work would be unsatisfying. “Cancer patients don’t want researchers to be focused on things that slow down cancer or may have relatively minor effects,” he said.